Bacon Cheeseburger Puffs - all the flavors of a bacon cheeseburger in bite-size form! Hamburger, bacon, cheese, bisquick - can bake and freezer for a quick snack later. These don't last long at parties! Tomorrow is A-Day here in Alabama. For you non-college football fans, A-Day is the spring football game for Auburn and Alabama. It seems like just yesterday we were watching all the National Champtionship game! I know everyone is itching to get back to the stadium and tailgate with friends and family. We certainly are! 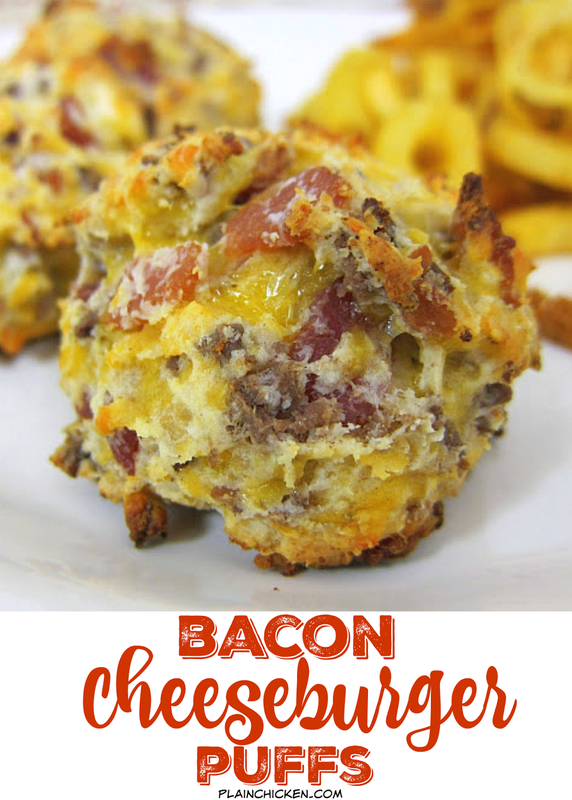 Here is a great recipe for your tailgate this weekend - Bacon Cheeseburger Puffs. All the flavors of a bacon cheeseburger in bite-size form. The best part is they taste delicious! These puffs can be made in advance and frozen until you need them. They are not only a great tailgating snack, they are wonderful for lunch, dinner. In a skillet, cook and crumble ground beef until no longer pink; drain. In a bowl, combine biscuit mix, bacon and cheese; stir in cooked beef. Add buttermilk and toss with a fork until just moistened. Shape into 1-1/2-in. balls. (I used a medium cookie scoop) Place 2 inches apart on ungreased baking sheets. Holy Heaven in one bite!! How many does this recipe make? Those look awesome. I sent an award to you on my blog! I live in Auburn and can't wait till tomorrow and A Day!! I also can't wait to try these yummy sounding and looking appetizers. I live in Prattville, Alabama. I can't wait to try these puffs. Roll Tide from Seattle Washington! These puffs look so good. This recipe is going on my must try list. Always the best tailgate food here, Steph! Do you cook the bacon before mixing? Tabitha - yes - the bacon should be cooked. I use a bag of Oscar Meyer bacon bits. Sounds yummy! I'm so happy I found your blog on Ziplist. Just made these for tailgating at a spring college football game. I of course had to taste test one before I take them...they aren't good.....they are SUPER GOOD!!! I did double the batch and towards the end had to add just a little bit more buttermilk because the mixture wasn't holding together. I think I'm going to add an onion to the ground beef when I brown it, since my whole family is addicted to onion. I'll let you know how it comes out. Could I use skim milk in place of buttermilk? I hate buying dairy products just to use a little bit. eepy - to make buttermilk at home - 1 cup milk plus 1 Tbsp white vinegar or lemon juice. Okay, thanks! I'm gonna try these tonight. Anyone tried them using either ground chicken or ground turkey instead of Beef??? Hey, I just came across your AMAZING blog! I'm a UK resident and really want to make these. However, I've no idea what you mean by "bacon bits" and "biscuit/baking mix". For bacon bits - fry up 4 or 5 slices of bacon and chop it up. I'm sorry to sound ever so stupid but what is shortening? haha I've never heard of it. RTR!!! Can't wait to try this new recipe for game days. Have you ever substituted the beef with sausage? Just curious, do you have to use buttermilk or will regular/skim milk work as well? Thank you! Ashleigh - you can use milk. I like to use buttermilk because I think it adds a nice flavor. You might not need as much milk as buttermilk. Add the milk slowly. Jan 6 this puffs are on and popping!!!! !